MOLINE, Ill.--(BUSINESS WIRE)--The equipment rental industry stands poised to set an industry record for revenues in 2015 according to the latest updated industry forecast from the American Rental Association (ARA), despite reduced demand for equipment in oil patch drilling sites. Rental companies historically are able to adapt to changing market conditions, shifting inventory and moving equipment to where demand is greater and today is no exception as lower oil prices are leading to greater consumer spending and fueling increased activity in construction as well as party and event market segments, offsetting the decline in opening new sites for drilling. The new quarterly ARA forecast from its ARA Rental Market Monitor™ subscription service has been modified slightly from February and the numbers remain very positive with total revenue growth of 7.9 percent expected in 2015 to reach a record $38.5 billion in the U.S., including all three industry segments — construction/industrial, general tool, and party and event. ARA’s current five-year forecast calls for steady growth of 7.2 percent in 2016, 8 percent in 2017, 7.9 percent in 2018 and 6.8 percent in 2019 to reach $51.3 billion. “Even as several forces, including harsh weather, held back U.S. economic growth in gross domestic product (GDP) to 0.2 percent in the first quarter, total rental revenue was up 4.9 percent in the same time period and is expected to exceed 9 percent in the second half of the year,” Wehrman says. Construction/industrial rental revenue is now forecast to increase 8.2 percent in 2015 to $25.9 billion, with general tool projected to grow 7.9 percent to $9.8 billion this year and party event to show a 4.7 percent increase to $2.7 billion. “The equipment rental industry will achieve its new peak level as a the result of a prolonged gradual improvement in the economy as a whole, and construction, industrial and consumer markets in particular,” says Scott Hazelton, managing director, IHS Economics and Country Risk, the respected global forecasting firm that compiles data for the ARA Rental Market Monitor. “The significant price reductions in oil are over and they will likely drift upwards over the year. Major cuts in new well drilling already have occurred and production will begin to taper off soon. We made the adjustments to the rental outlook for energy prices in February and we have not made any further adjustments as events are playing out approximately as anticipated,” Hazelton says. “While low oil prices have reduced growth prospects in the oil and gas area, that situation affects primarily production at this point. We still are seeing strong growth in downstream facilities, such as refineries and petrochemical processing plants. However, low oil prices have increased demand for other goods. For example, the U.S. is expected to demand 200,000 more light motor vehicles than previously expected, which creates rental opportunity within auto plants,” Hazelton says. “Lower energy costs also translate into improved consumer spending power and corporate profits, so the party and event sector also gets a boost,” he says. The construction/industrial rental penetration also was up 100 basis points in 2014, from 52.9 percent in 2013 to 53.9 percent for 2014, according to the ARA Rental Penetration Index™. ARA released the 2014 ARA Rental Penetration Index in February at The Rental Show 2015 in New Orleans. “Rental penetration continued to increase in conjunction with strong growth in rental revenues in 2014,” says John McClelland, ARA vice president for government affairs and chief economist. ARA’s Rental Penetration Index measures the proportion of the total fleet of construction machines that are owned by equipment rental companies. The index is value-based and uses original equipment cost as the primary weighting factor to calculate the ratio of rental equipment value to total fleet value. Sales into the rental channel by equipment manufacturers also continue to grow, meaning the penetration rate could climb higher this year. In addition, ARA is forecasting an increase of 8.3 percent in investment in equipment by rental companies this year. About ARA: (www.ARArental.org) The American Rental Association, Moline, Ill., is an international trade association for owners of equipment rental businesses and the manufacturers and suppliers of construction/industrial, general tool and party/event rental equipment. ARA members, which include more than 9,400 rental businesses and nearly 1,000 manufacturers and suppliers, are located in every U.S. state, every Canadian province and more than 30 countries worldwide. Founded in 1955, ARA is the source for information, advocacy, risk management, business development tools, education and training, networking and marketplace opportunities for the equipment rental industry throughout the world. About IHS (www.ihs.com) IHS (NYSE: IHS) is the leading source of insight, analytics and expertise in critical areas that shape today’s business landscape. Businesses and governments in more than 150 countries around the globe rely on the comprehensive content, expert independent analysis and flexible delivery methods of IHS to make high-impact decisions and develop strategies with speed and confidence. IHS has been in business since 1959 and became a publicly traded company on the New York Stock Exchange in 2005. Headquartered in Englewood, Colorado, USA, IHS is committed to sustainable, profitable growth and employs about 8,800 people in 32 countries around the world. IHS is a registered trademark of IHS Inc. All other company and product names may be trademarks of their respective owners. Copyright © 2015 IHS Inc. All rights reserved. 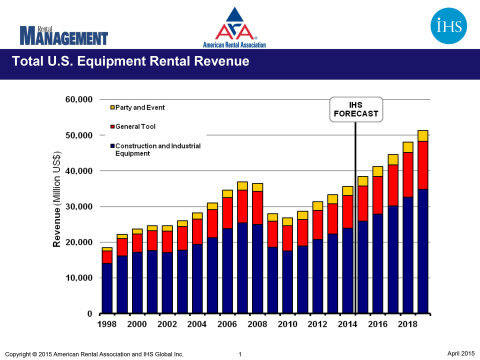 The equipment rental industry stands poised to set an industry record for revenues in 2015 according to the latest updated industry forecast from the American Rental Association (ARA).